Your Subconscious Mind Holds the Key to Naturally Being More Environmentally Aware, Friendly and Responsible; To Enjoy the Harmony of Being More “At One” with Our Planet! But you can get all the benefits for this low price. Simply listen to the Living on a Peaceful Green Planet Hypnosis MP3 every night as you go to bed for three weeks and feel the changes happening in your life. You will feel more empowered, more in touch with your true self, and you will truly know that your goals are within your reach. All you have to do is listen to the Living on a Peaceful Green Planet Hypnosis MP3 audio at night as you go to sleep!!! You’ll hear soft music, the gentle sounds of the beach, and the soothing sound of Steve G. Jones’ voice all working together to bring about positive changes in your life easily and naturally. And as you continue to relax and drift deeper and deeper you realize just how powerful you are. You realize you have the power to change the planet. You are so relaxed and so calm realizing that you can make a positive change on Earth. Every time you listen to this recording you get new and better ideas about living and promoting a green lifestyle. You are very environmentally responsible. Every time you go to throw away an item, you first ask the question: Can I reuse this item? Many items, such as glass and plastic containers can be reused for storing other items. You begin to ask yourself if paper can be used again, perhaps for packing material or wrapping things. You are constantly think of ways to reuse items. You think of ways to reuse paper and plastic bags. You realize that you can use them several times before they are no longer useful. If you are not already recycling, you make an effort to do so. You find out what items you can recycle. There are many plastic containers that can be recycled and you check for the triangle shaped symbol on the bottom of all containers before throwing them away in the trash. There are also many types of glass that can be recycled such as glass bottles and glass canisters. After reusing paper and plastic bags you take them to a place where they can be recycled. You enjoy being environmentally mindful. You realize that by doing your part, you can make the world a clean and wonderful place to live in. You become very interested in reducing your footprint here on Earth. You realize that you can make easy and simple changes around your house to consume less energy. You make sure that you turn off the lights whenever you leave the room. You use the most energy efficient light bulbs that you can find. You realize that you can be comfortable just by lowering your heat by two degrees in the winter and raising your air conditioner two degrees in the summer. You trade in inefficient appliances such as your refrigerator, oven, stove, washer, and dryer for efficient appliances with an energy star. You notice changes in your monthly bills with these new efficient appliances. You are also mindful of where you drive. You decide to take a bike if your destination is only a few miles away. When you drive somewhere, you manage your trip so that you’re driving the shortest route possible. If you travel to work every day by car and have co-workers who live nearby, you carpool with them to save gas. You enjoy making these small changes in your life. They make you feel as though you are doing the right thing, and you are doing the right thing. You are being environmentally responsible and you are proud of yourself. You also look into helping your local community. Perhaps you join a group that picks up litter in your neighborhood. Or maybe you join a group that plants trees and flowers in parks and public areas. When you see a piece of trash on the floor, you pick it up and either recycle it or throw it away. You promote living in a very clean planet. You set an excellent example for those around you. You are very aware of the impact that you have on this planet. You want the Earth to be a clean and healthy place to live for generations and generations of people. You enjoy living a green lifestyle. You get so much personal fulfillment by living a green lifestyle and promoting a peaceful clean planet. You feel so confident that you can improve the world we all live in. You realize that you can positively impact the Earth by doing your part. You promote others in leading a similar green lifestyle. You teach family members and friends how they too can make a difference. You also tell them how rewarding it is. It’s very easy being aware of what you consume and what you waste. You enjoy this new environmentally mindful lifestyle. You are making many changes in your life and they are positively changing the world around you. And so as you continue to relax and drift, you realize that everything is going to be just fine. This hypnosis program will open your world to living on a peaceful and green planet. We all know how important the Earth is to our lives. We also realize that our existence on this planet takes a toll on the Earth. Living on a Peaceful Green Planet Hypnosis MP3 session will make you more consciously aware of the footprint you are leaving on this earth. The Earth provides us with many renewable resources. You can do your part by using renewable resources. This hypnosis program will encourage you to live your life in such a way so that you promote a peaceful and clean Earth. This program will help you realize that there is so much you can do to promote a clean Earth. 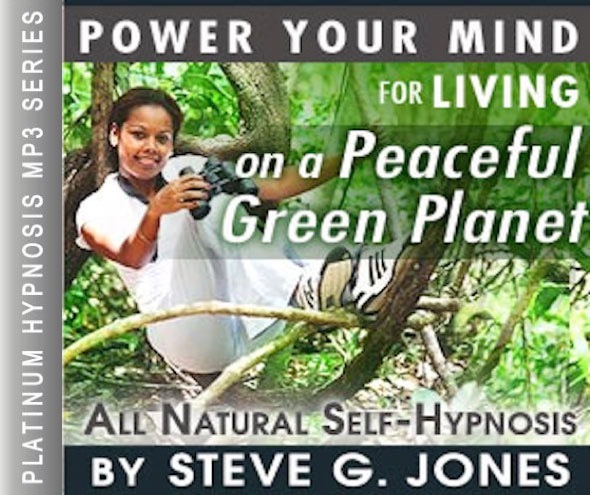 The Living on a Peaceful Green Planet Hypnosis MP3 recording will give you the motivation and clarity you need to promote a green and healthy earth. You can make a big difference. After listening to this hypnosis session for 21 nights in a row, you will feel more motivated to do your part in promoting a peaceful planet. You will realize how important it is for you to lead a life where you are not polluting Mother Nature. You will grow to appreciate your surroundings more and you will respect the world that surrounds you. You will realize that as you dedicate your life to being clean and peaceful to the earth, others will follow suit, creating a more peaceful place to live. Hypnotherapy is a powerful tool that can be used to make any type of positive change in your life. If you wish to improve the planet, then this hypnosis recording is for you. You will realize that this recording will help you influence others to be as responsible as you are. Day by day you will lead a cleaner and more peaceful life so that you make the world a better place.